Helloworld Travel and its wholesale brands including AOT Inbound, a.t.s. Pacific, ETA, Qantas Holidays, Viva! Holidays, Sunlover Holidays, ReadyRooms, Need it Now, Go Holidays and Insider Journey are committed to promoting and selling Australian holidays. This is the largest tourism trade distribution that any tourism business could wish for and we congratulate our participating operators! 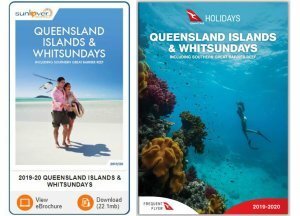 5 x 2019-20 QLD Islands & Whitsundays, Southern Great Barrier Reef brochures were released to Australian and New Zealand market last week. This is perfect timing as it is peak booking season and currently within the 60 -90 day wholesale booking lead time window for 1 April and beyond. The brochure has over 60 pages of product covering the Islands, Whitsundays, Mackay and Southern Great Barrier Reef Regions. 4 x SGBR Island resorts are featured, each with a full page with plenty of info on how to get there, the island, the resort and the experiences on offer. The Southern Great Barrier Reef section of the brochure includes our contracted accommodation and tours including Capricorn Caves, Freedom Fast Cats, Salt Yeppoon, Beaches on Lammermoor, Echelon, Empire Apartment Hotel and Travelodge, with a new operator this year NRMA Capricorn Yeppoon Holiday Park. Also contracted and featured within the SGBR section are Lagoons 1770 Resort & Spa, Sandcastles 1770, Kelly’s Beach Bargara, Bundaberg Rum, Larc! Environmental Tour and Lady Musgrave Day Cruise. The three Regional Tourism Organisations of Capricorn, Gladstone and Bundaberg once again partnered to fully fund a Double Page Southern Great Barrier Reef feature to support our operators and destination, which is an ideal sales tool & resource for agents and the public. You can’t beat that as a third party endorsement for Great Keppel Island and our destination – thanks Chris! « Korte’s Resort comes in at number 5 in TripAdvisor’s Travellers’ Choice – Australia!